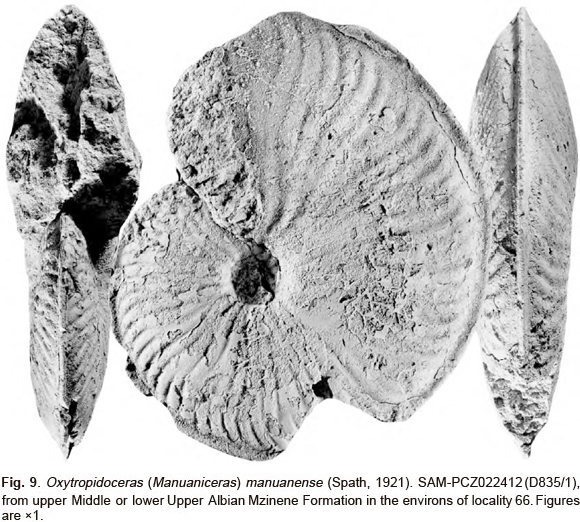 Ten species of the distinctive oxycone ammonite Oxytropidoceras are described from the Middle and lower Upper Albian Mzinene Formation of northern KwaZulu-Natal. Oxytropidoceras (O.) alticarinatum (Spath, 1922) was originally described from western Europe. O. (Manuaniceras) manuanense (Spath, 1921), O. (M.) falcatum sp. nov. and O. (Venezoliceras) umsinenense (Van Hoepen, 1931) are only known from northern KwaZulu-Natal. The following species were previously recorded from Madagascar: O. (O.) basseae (Besairie, 1936), O. (O.) hoepeni Collignon, 1936, O. (Adkinsites) multituberculatus Collignon, 1936, O. (Mirapelia) hourcqi Collignon, 1936, and O. (M.) colcanapi Collignon, 1936. O. (Venezoliceras) madagascariense Collignon, 1949, was recorded from Madagascar, southern Mozambique and Venezuela. 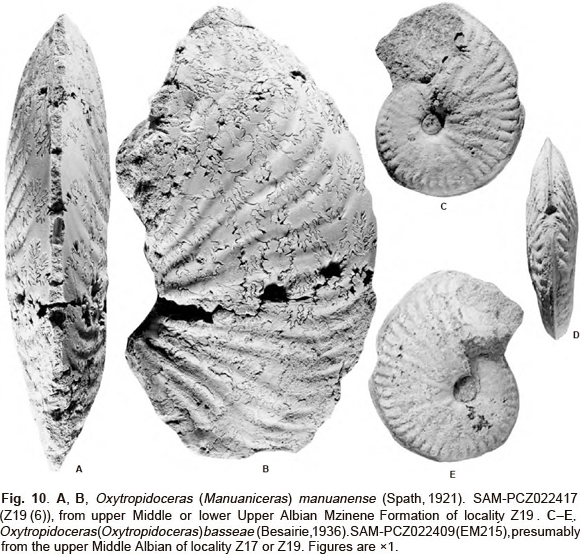 Keywords: ammonites, Oxytropidoceras, Albian, Cretaceous, KwaZulu-Natal, South Africa. Oxytropidoceras (Oxytropidoceras) alticarinatum (Spath, 1922). Oxytropidoceras (Oxytropidoceras) basseae (Besairie, 1936). Oxytropidoceras (Oxytropidoceras) hoepeni Collignon, 1936. Oxytropidoceras (Manuaniceras) manuanense (Spath, 1921). Oxytropidoceras (Manuaniceras) falcatum sp. nov. Oxytropidoceras (Adkinsites) multituberculatus Collignon, 1936. Oxytropidoceras (Venezoliceras) umsinenense (Van Hoepen, 1931). Oxytropidoceras (Venezoliceras) madagascariense Collignon, 1949. 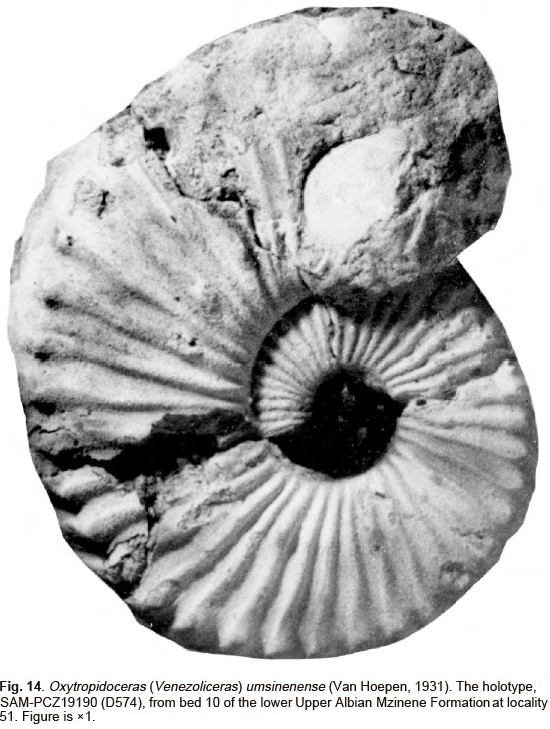 Oxytropidoceras (Mirapelia) hourcqi Collignon, 1936. Oxytropidoceras (Mirapelia) colcanapi Collignon, 1936. Europe (where it is very rare outside of southeastern France) to Morocco, Tunisia, Angola, southern Mozambique, KwaZulu-Natal in South Africa, Madagascar, Pakistan, China (Tibet), Georgia, California, Texas, Mexico, Puerto Rico, Venezuela, Colombia, Peru and Brazil. In KwaZulu-Natal, O. (O.) alticarinatum occurs in Albian III of Kennedy & Klinger (1975), in association with Lyelliceras lyelli (d'Orbigny, 1841), which dates it as basal Middle Albian in terms of the international standard (Hart et al. 1996). Oxytropidoceras (O.) hoepeni , O. (A.) multituberculatus O. (M.) hourcqi and O. (M.) colcanapi are assigned to the Middle Albian, Albian IV ofKennedy & Klinger (1975) on the basis of their geographic location in relation to well-dated faunas in northern KwaZulu-Natal. This dating is in agreement with their co-occurrence in a one to two metre-thick glauconitic sandstone at Androiavy, Madagascar (Besairie 1936, p. 78), and the correlative unit at Berambo (Besairie 1936, p. 76). Oxytropidoceras (M.) falcatum was collected in the environs of locality 144 of Kennedy & Klinger (1975), and may be uppermost Middle or lower Upper Albian. Oxytropidoceras (Manuaniceras) manuanense (Spath, 1921) has been collected in situ in bed 1 of the section at locality 51 ofKennedy & Klinger (1975), and dated as uppermost Middle Albian, as it occurs immediately below the first occurrence of Dipoloceras cristatum (d'Orbigny, 1841), the international marker for the base of the Upper Albian (Hart et al. 1996). Oxytropidoceras (Oxytropidoceras) basseae (Besairie, 1936) and Oxytropidoceras (Venezoliceras) umsinenense (Van Hoepen, 1931) have been collected in situ at locality 51 of Kennedy & Klinger (1975), and are firmly dated as lower Upper Albian. O. (V.) madagascariense is similarly dated on the basis of the type occurrence in Madagascar (Collignon 1949, p. 37). The following abbreviations are used to indicate the repositories of specimens cited in the text: BMNH: The Natural History Museum, London. OUM: Oxford University Museum of Natural History. SAM: Natural History Collections Department, Iziko South African Museum, Cape Town. 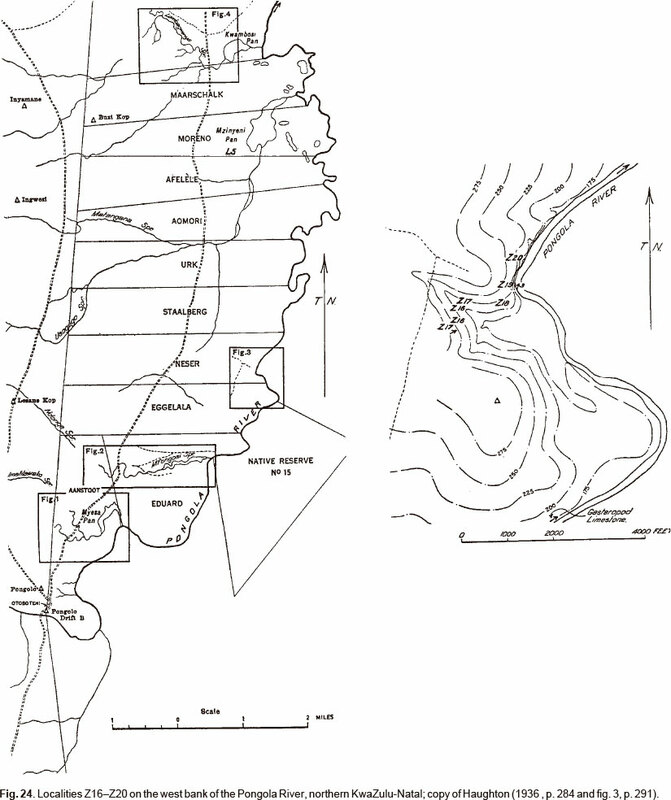 Details of most field localities are given by Kennedy & Klinger (1975); further descriptions of these localities are deposited in the Geological Collections, Oxford University Museum of Natural History, The Natural History Museum, London, and the Natural History Collections Department, Iziko South African Museum, Cape Town. Specimens with catalogue number prefixes Z16-Z20 in brackets are from localities on the western side of the Pongola River, north of the Mfongozi Spruit, described by Haughton (1936, pp. 290-292, fig. 3), reproduced here as Fig. 24. We have not been able to collect from these localities, and we provisionally retain Haughton's annotations for these. Dimensions are given in millimetres: D= diameter; Wb = whorl breadth; Wh = whorl height; U = umbilicus; c = costal dimension; ic = intercostals dimension; R = number ofribs per whorl. 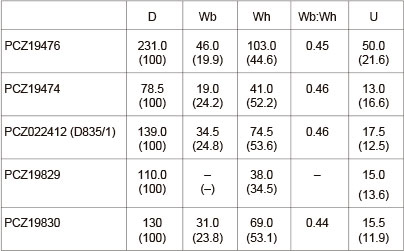 Figures in brackets are dimensions as a percentage of the diameter. Ammonites roissyanus d'Orbigny, 1841, p. 302, pl. 89, by the original designation of Stieler, 1920, p. 346. 1858 Ammonites roissyanus d'Orb; Pictet & Campiche, pp. 173-176 (pars), pl. 21, figs 3a, 3b, 4. 1922 Pseudophacoceras alticarinatum Spath, p. 98. 1978 Oxytropidoceras alticarinatum (Spath); Casey, p. 630, pl. 99, figs 13, 14, text-fig. 240 (with additional synonymy). The lectotype, by the subsequent designation of Casey, 1978, p. 631, is the original of Pictet & Campiche, 1858, p. 173, pl. 21, fig. 3a, 3b, from the 'Gault Moyen' of Sainte-Croix, Vaud, Switzerland. One of the original figures of the lectotype is reproduced by Casey (1978, fig. 240a). The original syntypes of Pictet & Campiche have not been traced, and they may have decomposed, for as the authors stated they were 'á l'état de moules pyriteuse.' The occurrence of 'Ammonites mammillatus' (Pictet & Campiche, 1858, p. 208) in pyritic preservation in the 'Gault Moyen' dates the material no more precisely than upper Lower to basal Middle Albian. SAM-PCZ022403 (H76/14), 022423 (H76/15), 022404 (H76/16), 022405 (H76/26), from the lowest Middle Albian, Albian III, Mzinene Formation at locality 154 of Kennedy & Klinger (1975). PCZ022406 (Z17) from locality Z17. Coiling is moderately involute, with a small, shallow umbilicus that comprises around 19% of the diameter. The umbilical wall is low, sloping outwards, with a broadly rounded shoulder. The whorl section is lanceolate, with the greatest breadth below mid-flank. The inner flanks are swollen, the outer flanks convergent. There is a high, sharp, entire keel. There are 24 primary ribs per whorl. They arise at the umbilical seam, and are strong, narrow, and prorsiradiate, straight to feebly flexuous on the flanks, across which they strengthen progressively. They reach their maximum strength at the umbilical shoulder, where they develop into a narrow, pinched elevation. From this point the ribs sweep forwards, and are markedly concave. They are strongly projected forwards on the venter, narrow, and decline rapidly. The keel is ornamented by growth lines and striae only. These small specimens have a comparable ribbing style and density as in the no-doubt idealized figures of the type material. Similarly small individuals from southern England (Casey, 1978, pl. 99, figs 13, 14) are the only other figured examples of this species. The KwaZulu-Natal material is associated with Lyelliceras lyelli (d'Orbigny, 1841), and are thus dated as basal Middle Albian. The English records are from the condensed Cleoniceras floridum-Protohoplites puzosianus Zone fauna of the main mammillatum bed at Folkestone, Kent. Records from Isère in France are from a condensed Lower and lower Middle Albian unit at la Balme de Rencurel (Breistroffer 1947). 1936 Manuaniceras basseae Besairie, p. 190, pl. 17, fig. 5, text-fig. 12e. 1963 Manuaniceras bassae [sic] Besr. ; Collignon, p. 134, pl. 293, fig. 1278. 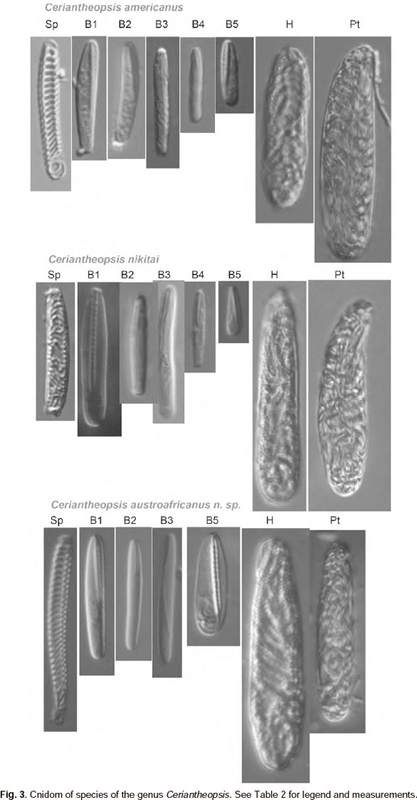 The holotype, by monotypy, is the original of Besairie 1936, p. 190, pl. 17, fig. 5, text-fig. 12e, refigured by Collignon, 1963, p. 134, pl. 293, fig. 1278, in the collections of the Sorbonne, now housed in the Laboratoire de Paléontologie of the Muséum National d'Histoire Naturelle, Paris. It is from the Middle Albianof Androiavy, Madagascar. SAM-PCZ022407 (D835/7-1), SAM-PCZ022408 (D835/7), OUM KY11834, from the lower Upper Albian of bed 6 at locality 51 ofKennedy & Klinger (1975) and SAM-PCZ022409 (EM215) from the lower Upper Albian at locality Z17 orZ19. All specimens are juveniles. SAM-PCZ022408 (D835/7) (Fig. 1J) is 51 mm in diameter. Five umbilical bullae per half whorl perch on the umbilical shoulder. They give rise to primary ribs that extend to the inner flank, where they flex back and split into two or three concave secondaryribs, as do occasional non-bullate primaries. There are 20-22 ribs per half whorl at the ventrolateral shoulder. The ribs flex forwards over the ventrolateral shoulders, where they strengthen and broaden before progressively weakening, project strongly forwards across the venter, and disappear before reaching the shallow grooves that flank the prominent ventral keel. SAM-PCZ022407 (D835/7-1) (Fig. 1H,I) is a fragment of an individual of comparable size and style of ornament, with stronger flank ribs. OUM KX11834 (Fig. 2) is a well-preserved phragmocone 43.7 mm in diameter with a whorl breadth to height ratio of 0.49. The inner flanks are smooth on the adapical half of the outer whorl; six feeble, progressively strengthening bullae are present on the adapertural half whorl. They give rise to pairs of ribs, which may bifurcate, while additional ribs intercalate to give a total of 28 per whorl. The ribs broaden and strengthen on the outermost flank and ventrolateral shoulder, where they are markedly concave. As in the previous specimens they then decline markedly on the remaining section of the venter. SAM-PCZ022409 (EM215) (Fig. 10C-E) is 56.8 mm in diameter, and is interpreted as a densicostate variant, with twelve feeble to obsolete bullae on the umbilical shoulder, the ribs increasing by bifurcating at various points on the flanks to give a total of 40-41 ribs at the ventrolateral shoulder. 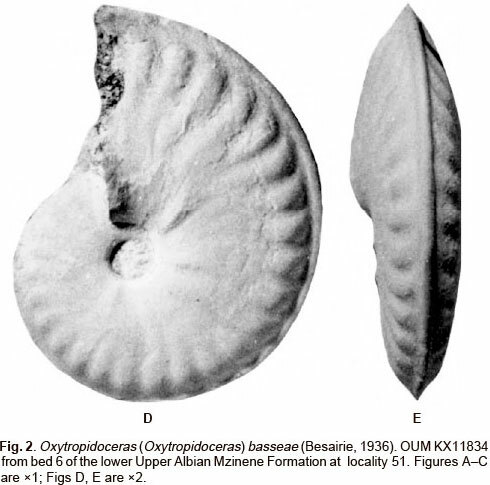 Upper Middle Albian, Zone á Oxytropidoceras alticarinatum et Manuaniceras jacobi in Madagascar, and lower Upper Albian (lower part of Albian V), in northern KwaZulu-Natal. 1936 Oxytropidoceras hoepeni Collignon, p. 184, pl.19, fig. 2, text-fig. 12o. The holotype is the original of Collignon, 1936, p. 184, pl. 19, fig. 2, text-fig. 12o, in the collections of the Sorbonne, now housed in the Laboratoire de Paléontologie of the Muséum National d'Histoire Naturelle, Paris. It is from the upper Middle Albian of Androiavy, Madagascar. SAM-PCZ022410 (Z19 (4)), from the upper Middle Albian of locality Z19. The specimen is an adult approximately 250 mm in diameter, and shows eccentric coiling to the body chamber. The umbilicus comprises approximately 16.7% at a diameter of 180 mm, and 42% at the end of the body chamber. On the phragmocone, coiling is very involute, the conical umbilicus small and shallow. The whorl section is lanceolate, with the greatest breadth below mid flank. The inner flanks are broadly rounded, the outer flanks converging to a sharp venter with a high keel. At the smallest diameter visible within the umbilicus, the inner flank ornament is highlydis-tinctive, with ribs arising in groups ofthree at the umbilical shoulder. They are narrow, rounded, radial, and borne on broad folds, separated by depressions in which the beginnings ofshorter intercalated ribs are just preserved. On the outer whorl, the phragmocone bears approximately 30 fine, delicate, low, rounded ribs per halfwhorl. Most ofthese arise at the umbilical shoulder, either singly, or in groups oftwo or three, some connected by mere striae. A few ribs branch on the flank, and there are occasional intercalatories. The ribs are prorsiradiate, narrow and straight to mid flank, where they flex slightly, and broaden. They reach their maximum breadth on the outer flank, where they are feebly concave. The ribs project strongly forwards on the ventrolateral shoulder, taper, and decline into mere lirae and striae, disappearing before they reach the keel. 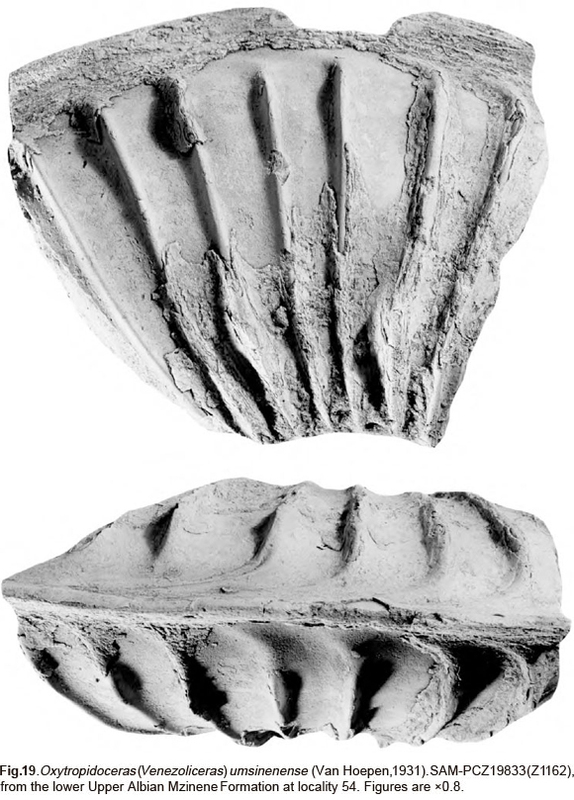 This type of ornament persists onto the adapical part of the body chamber, but thereafter declines, to be replaced by crowded flexuous riblets, lirae and striae, which efface on the outer flank, where the ornament is markedly concave, projecting strongly forwards on the mould, and indicating the presence of a long apertural rostrum. SAM-PCZ022411 (Z19(8)), a juvenile fragment, probably belongs to this species. It shows feeble irregular ribbing at a whorl height of 48 mm. 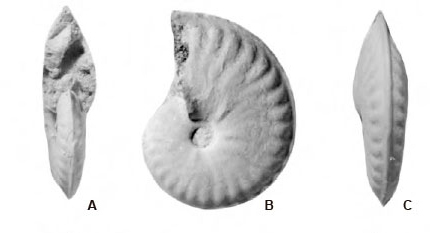 The outer whorl of the present specimen differs in no significant respects from the holotype, with a whorl breadth to height ratio of 0.42, vs 0.44 in the holotype. The inner whorls are very distinctive in our specimen, the branching of ribs at the umbilical shoulder being more marked than in the holotype, where they arise either singly or in pairs, with intercalated ribs present in both specimens. Upper Middle Albian of Madagascar and northern KwaZulu-Natal. 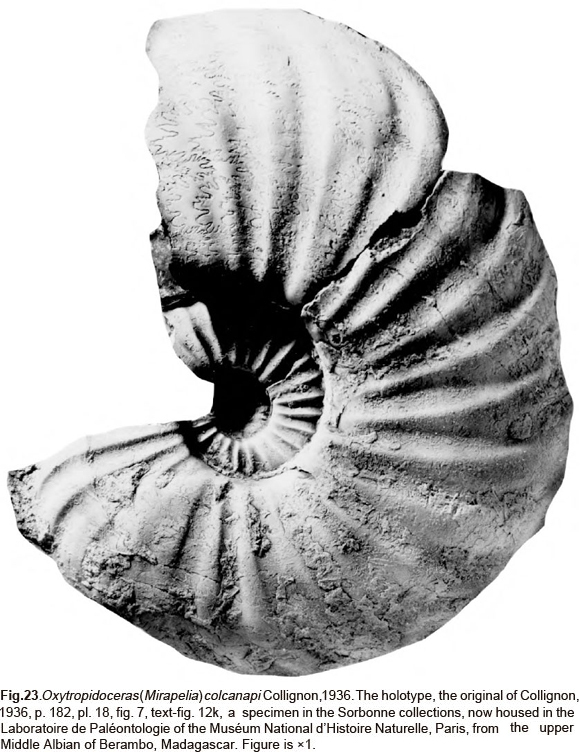 Pseudophacoceras manuanense Spath, 1921, p. 281, pl. 25, fig. 1a-d,bythe original designation of Spath, 1925, p. 182. Manuaniceras are Oxytropidoceras that lack tubercles and have bifurcating low, flat, ribbon-like ribs separated by narrow interspaces. 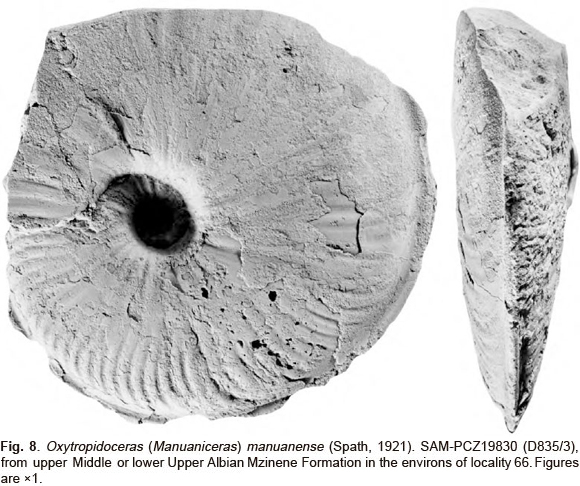 Cooper (1982) and Wright (1996) regarded Manuaniceras as a synonym of Oxytropidoceras (Oxytropidoceras). 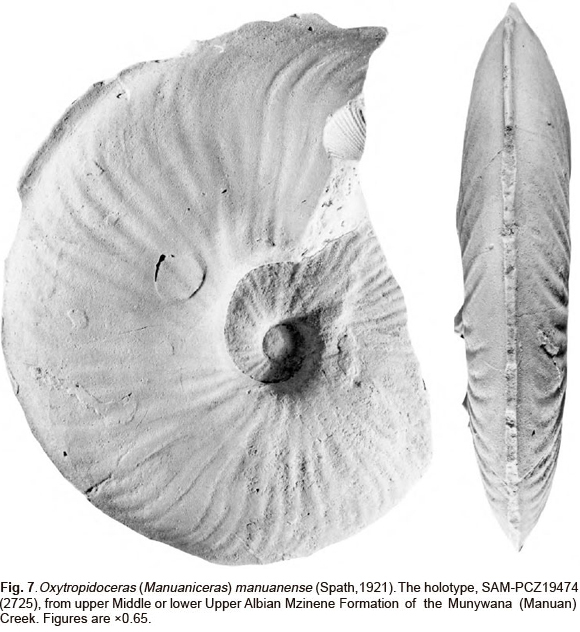 Cooper (1982, p. 290) stated that "Collignon (1936) provided the following emended diagnosis of Manuaniceras: 'Ammonites with few whorls, which are much higher than wide; there are many flat ribs at some stage in the ontogeny, and the ribs may be single or bifurcating at one or more positions at the umbilicus or on the flank.' Unfortunately, however, flat topped ribs are not a feature of manuanense (Spath) ... and cannot be used in the formulation of the diagnosis of this taxon." In support of this, Cooper illustrated as his text-fig. 31B the original of Spath, 1921, pl. 25, fig. 1c refigured here as Fig. 4E, where it is reunited with the outer whorl fragment not illustrated by Cooper (or Spath), which indeed bears flat ribs. The large macroconch phragmocone fragment illustrated here as Fig. 11 shows the same style of ribbing on the penultimate whorl as on the inner whorls of this specimen, and an outer, but still septate whorl with the diagnostic flat ribbing. It is our view that this distinctive ornament defines a natural group that merits subgeneric status by comparison with the other subgenera recognized within Oxytropidoceras. 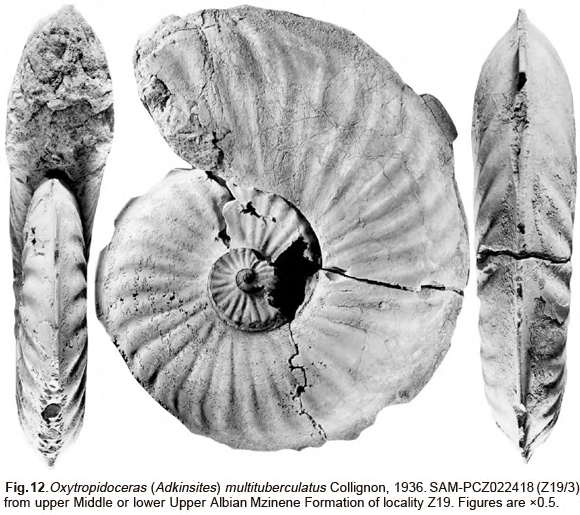 Pseudophacoceras Spath, 1921, with Ammonites roissyanus d'Orbigny, 1841, p. 302, pl. 89, is an objective synonym of Oxytropidoceras Stieler, 1920, p. 346, having the same type species, as noted by Spath, 1925, p. 182. 1921 Pseudophacoceras manuanense Spath, p. 281, pl. 25, fig. 1. 1982 Oxytropidoceras (Oxytropidoceras) manuanense (Spath); Cooper, p. 309, text-fig. 31B. 1996 Oxytropidoceras (Oxytropidoceras) manuanense (Spath); Wright, p. 138, fig. 106d,e. The holotype is SAM-PCZ19474 (formerly 2725), the original of Spath, 1921, p. 281, pl. 25, fig. 1a,b, re-illustrated here as Fig. 7, and said to be from the Munywana (Manuan) Creek, and collected by the resident magistrate at Ubombo (Spath, 1921, p. 284). SAM-PCZ19476 (formerly 2726), the original of Spath, 1921, pl. 5, figs 1c, 1d, from the same locality as the holotype. BMNH C78875, C78877-8, C78889 and SAM-PCZ19802, 19803 (H207/7), SAM-PCZ17090-92 (H 207/1/5, H207/1/8, H207/1/6) are from the uppermost Middle Albian (top of Albian IV) ofbed 1 at locality51of Kennedy & Klinger (1975, fig. 4). SAM-PCZ19828 (D835/4), 022412 (D835/1), PCZ19829 (D835/2), PCZ19830 (D835/3), PCZ022413 (D835/5), PCZ022414 (D835/6), PCZ022415 (D835/8), from the environs of locality 66 of Kennedy & Klinger (1975). SAM-PCZ022416 (Z19), and SAM-PCZ022417 (Z19/6) from the uppermost Middle Albian of locality Z19; OUM K10031, from the Mzinene Formation, Albian IV, between locality 176 and the western end of locality 177 of Kennedy & Klinger (1975) in the Ndumu area ofnorthern KwaZulu. Coiling is evolute, with a small, shallow, crater-like umbilicus, comprising 11.9-16.6% of the diameter on the phragmocone. The low umbilical wall slopes outwards, and the umbilical shoulder is broadly rounded. The whorl section is very compressed, with whorl breadth to height ratios of 0.44-0.46, the greatest breadth just outside the umbilical shoulder. The inner flanks are feebly convex; the outer flanks are flattened, and converge to the narrow venter. There is a sharp keel on internal moulds. Where shell is preserved (for example SAM-PCZ19829: Fig. 5C,D), there is a pronounced groove on either side of the keel such that the inner part of the keel is thinner than the outer part. 20-24 ribs per whorl arise at the umbilical seam, and strengthen over the umbilical wall and shoulder, without developing into well-defined umbilical bullae. The ribs bi- or trifurcate at the umbilical shoulder, and may also bifurcate at mid-flank, and on the outer flank, where occasional intercalated ribs arise, to give a total of70-80 ribs per whorl at the ventrolateral shoulder. The ribs are low, flat, as wide as or wider than the interspaces. They are prorsiradiate, straight on the inner flank feebly convex at mid-flank, flexed back and concave on the outer flank, reaching their maximum strength on the ventrolateral shoulder, from where theyflex forwards and are strongly projected on the venter. 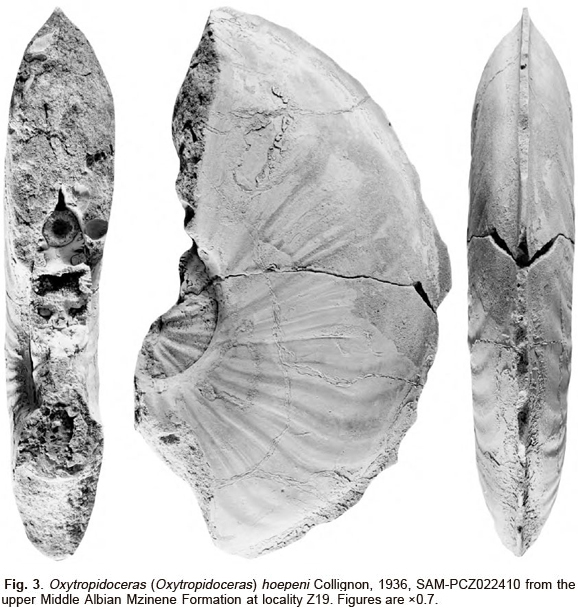 Where shell is preserved, as in SAM-PCZ19829 (Fig. 5C), fine growth lines and striae project forwards on the venter, and define the shape of the long ventral apertural rostrum. Maturity is marked by the egression of the umbilical seam, and the development of eccentric coiling. The ca. 85 mm diameter phragmocone of SAM-PCZ19476 (Fig. 4E) was figured by Spath (1921, pl. 25, fig. 1c) without the critical body chamber fragment, the two parts reunited in Fig. 4E herein. The coiling and effaced ornament of the bodychamber fragment show the specimen to be an incomplete micro-conch. SAM-PCZ19830 (Fig. 8) has a phragmocone 110 mm in diameter. It retains a 240° sector of body chamber, and shows marked weakening of ornament on the inner flanks on the adapical end of the body chamber, although this strengthens again towards the aperture. The holotype, SAM-PCZ19474 (Fig. 7) is a somewhat worn adult macro-conch, with a phragmocone diameter of 155 mm. It shows a decline in rib strength towards the adult aperture, and a change from branching to predominantly single ribs; the adapertural part of the body chamber is slightly contracted. BMNH C78875 (Fig. 11) is also an adult macroconch, a 180 mm long fragment of a huge phragmocone, with a maximum preserved whorl height of 95 mm and a whorl breadth to height ratio of 0.43. Most of the Manuaniceras described from Madagascar by Besairie (1936) and Collignon (1963) belong to other subgenera. O. (M.) spathi Besairie (1936, p. 189, pl. 17, fig. 3, text-fig. 12c) has primary ribs well developed on the nucleus to a diameter of 70 mm. Beyond this, there are primary ribs that are restricted to the inner flank only, the outer flanks are smooth according to Besairie. O. (M.) inerme Collignon, 1963, p. 136, pl. 294, has weak primary ribs on the inner whorls, the outer whorl is virtually smooth. The type material of these species come from the same horizon and locality (Androiavy) and they may well be no more than intraspecific variants. Oxytropidoceras (Manuaniceras) manuanense is only recorded from northern KwaZulu-Natal. Specimens we have collected come from bed 1 at locality 51. 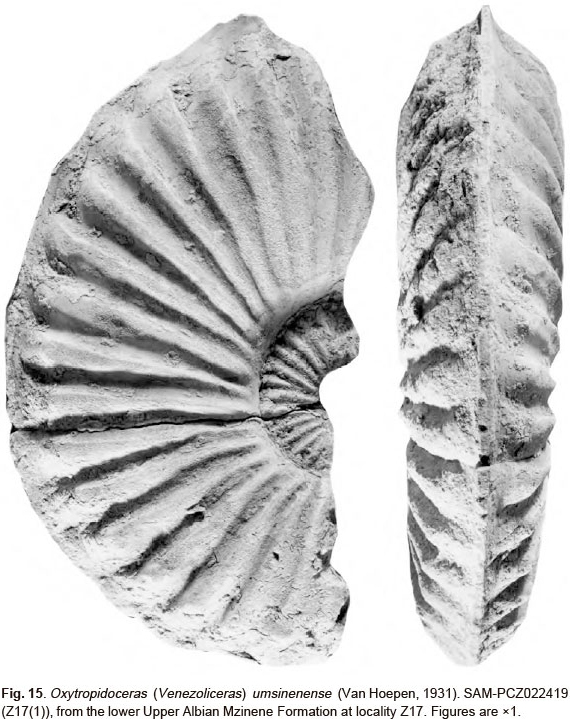 Dipoloceras cristatum occurs just above this level suggesting the species to be uppermost Middle Albian. Previously collected specimens are from the uppermost Middle or lowest Upper Albian. Oxytropidoceras (Manuaniceras) falcatum sp. nov. The holotype is SAM-PCZ19827 (D1183), from the uppermost Middle or lower upper Albian Mzinene Formation in the environs of locality 144 ofKennedy & Klinger (1975) in the southern part of the Mkuze Game Reserve. A Manuaniceras with broad, flat bifurcating crescentic ribs, the adapical edge convex, the adapertural face concave. 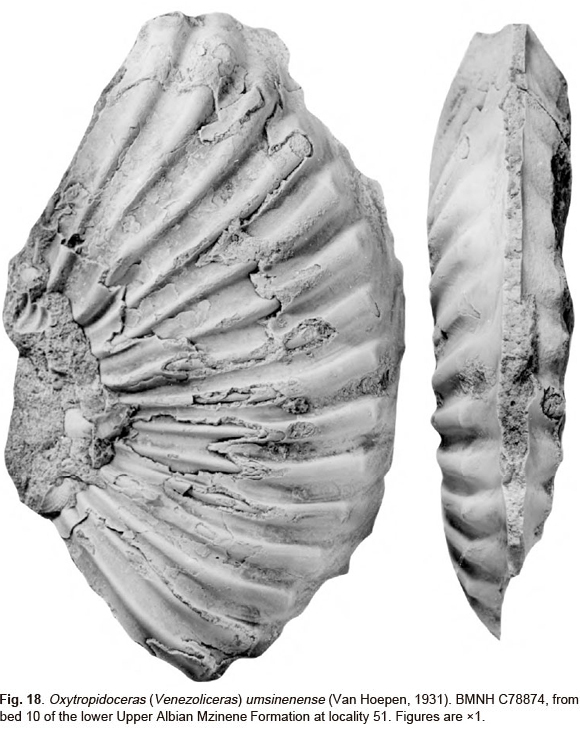 The specimen is a fragment only, with a maximum preserved whorl height of 67 mm. Oxycone, the whorl section is very compressed, with a tiny, near-occluded umbilicus. Feeble primary ribs arise at the umbilical seam. They broaden rapidly across the flanks, bifurcating at the umbilical shoulder or on the inner flank. Occasional ribs bifurcate at mid-flank. The ribs are very broad across the middle of the flanks, flat-topped, and separated by narrower interspaces. They are prorsiradiate and very strongly convexi-concave, and taper on the outer flank. The venter is not preserved. The near occluded umbilicus, very broad bifurcating meniscus-shaped convexi-concave ribs are utterly distinctive and separate the species from all others referred to the subgenus. Ammonites belknapi Marcou, 1858, p. 34, pl. 2, fig. 1, from the lower Upper Albian of Texas by original designation of Spath, 1931, p. 350. 1936 Oxytropidoceras (Androiavites) multituberculatus Collignon, p. 186, pl. 19, figs 1, 3, text-fig. 12n. 1963 Oxytropidoceras (Androyavites) [sic] multituberculatum Coll. ; Collignon, p. 138, pl. 295, fig. 1281. 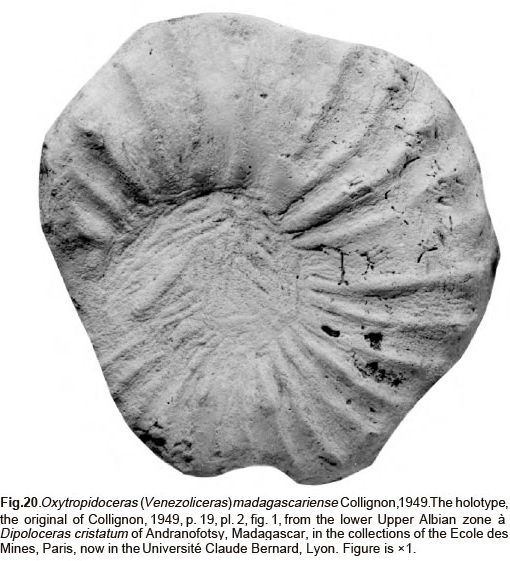 The holotype, by original designation, is the original of Collignon, 1936, p. 186, pl. 19, fig. 1, a specimen in the Sorbonne collections, now housed in the Laboratoire de Paléontologie of the Muséum National d'Histoire Naturelle, Paris, fromthe upper Middle Albianof Androiavy, Madagascar. SAM-PCZ022418 (Z19(3)), from the upper Middle Albian Mzinene Formation of locality Z19. SAM-PCZ022418 (Z19 (3)) is a mature adult, with a 240° sector of body chamber preserved. Coiling is evolute, the umbilical seam of the body chamber egressing markedly. The whorl section is compressed, lanceolate, with a whorl breadth to height ratio of 0.55, the greatest breadth below mid-flank. The umbilicus is shallow, with an outward-inclined umbilical wall and shoulder, broadly rounded inner flanks, convergent outer flanks, and a prominent, high, entire ventral keel. There are 25-26 ribs per whorl at the smallest diameter preserved. They are broad, flexuous, and prorsiradiate; most are primaries, arising at weak to incipient umbilical bullae; there are a few intercalatories. The phragmocone is 215 mm in diameter, and bears an estimated 30-31 broad, prorsiradiate ribs on its outer whorl. They arise at the umbilical seam, and strengthen on the umbilical shoulder without developing into bullae. They pass straight across the inner to middle flanks, where they are broad, although narrower than the interspaces. They flex gently forwards and broaden on the ventrolateral shoulders, where they become spatulate and decline before reaching the keel. They flex gently forwards on the adult body chamber, weaken, crowd, and become more markedly prorsiradiate, project forwards, and are concave on outer flank and ventrolateral shoulders, where they efface. The aperture is not preserved. The adult whorl of the present specimen differs in no significant respects from that of the holotype. Collignon (1936, p. 187) separated this species from O. (Adkinsites) besairiei Collignon, 1936 (p. 186, pl. 18, fig. 3; pl. 20, fig. 4) from the same horizon and locality on the basis of the more numerous and more massive umbilical tubercles of multituberculatus. Strong umbilical tubercles in the penultimate whorl are well-shown by both the holotype (they are more obvious in Collignon's (1963) illustration of the specimen) and Collignon's second specimen. This feature is only weakly expressed in the present material. 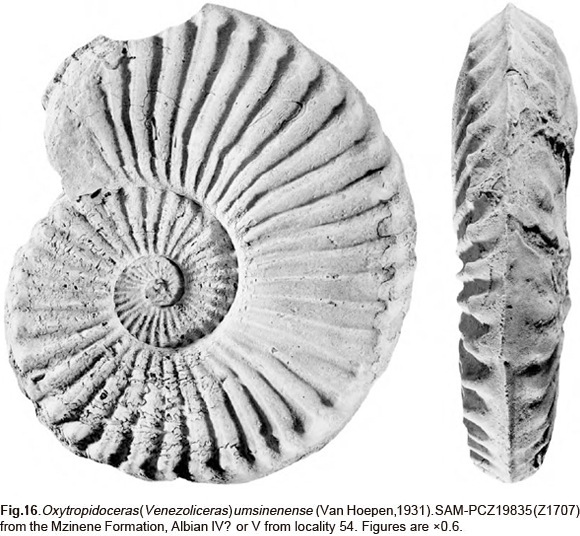 (= Lophoceras Van Hoepen, 1931, p. 40, non Hyatt, 1893, p. 466; Tarfayites Collignon, 1977, p. 13 (1963, p. 142, nomen nudum). 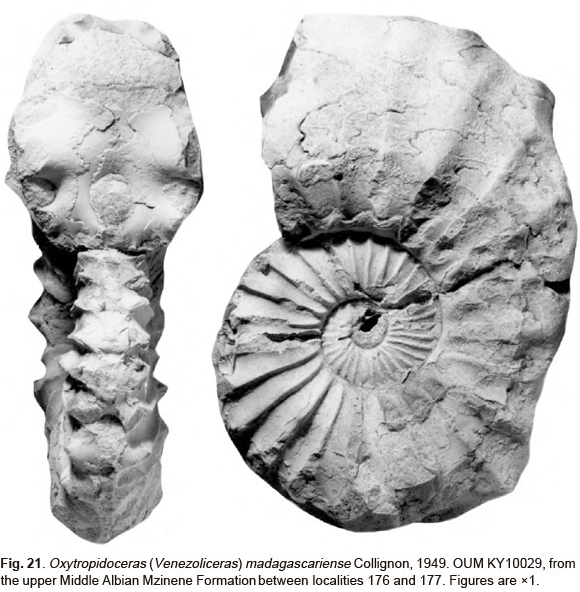 Oxytropidoceras venezolanum Stieler, 1920, p. 394, from the lower Upper Albian of Venezuela, by original designation of Spath 1925, p. 182. Venezoliceras are Oxytropidoceras in which some of the primary ribs develop a lateral bulla and all ribs develop a ventrolateral bulla. 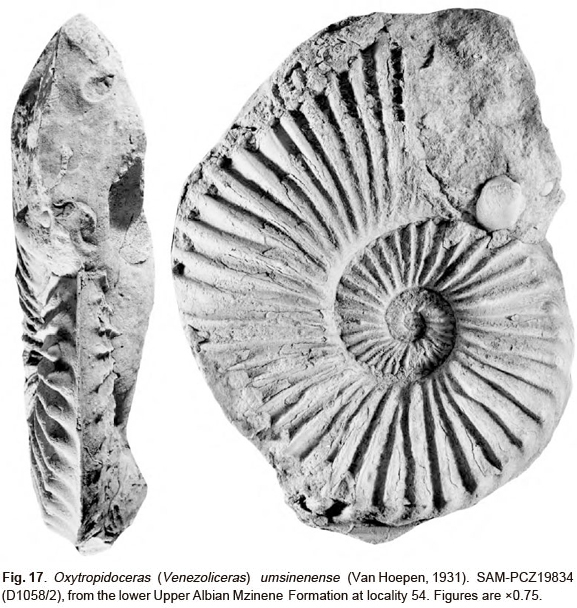 Lophoceras Van Hoepen, 1931 (non Hyatt, 1893, p. 466, a nautiloid) is a clear subjective synonym, as is Tarfayites. Two species are recognized in the limited material from KwaZulu, O. (V.) umsinenense (Van Hoepen, 1931) and O. (V) madagascariense Collignon, 1949. The differences between them are no greater than that encompassed by the normal range ofintraspecific variation displayed by acanthoceratoid ammonites with a comparable strength of ribbing and tuberculation, but we cannot demonstrate them to be conspecific on the basis of our material, and retain a conservative taxonomy here. We very much doubt that the ten Venezoliceras species from lower Upper Albian of Venezuela described by Renz (1968) merit separation, and note that his material includes individuals which are referred or compared to O (V) madagascariense described below. 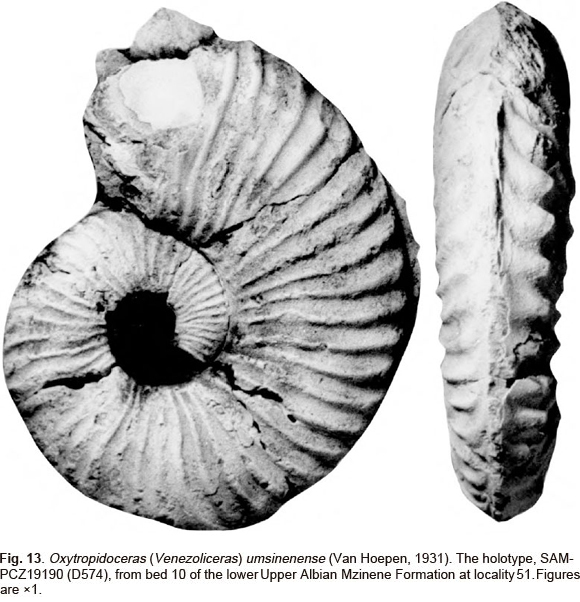 1931 Lophoceras umsinenense Van Hoepen, p. 41, text-figs 1,2. The holotype is SAM-PCZ19190 (formerly D574), the original ofVan Hoepen, 1931, p. 41, text-figs 1, 2, from the lower Upper Albian, bed 10 of the Mzinene Formation at Locality 51 of Kennedy & Klinger (1975), illustrated here as Figs 13, 14 (the specimen was coated with acrylic paint by a former member of staff at the South African Museum, obscuring the finest surface detail). SAM-PCZ022418 (Z17(1)), PCZ022420 (Z16(D)), PCZ022421 (Z16(B)), PCZ022422 (LJE167), SAM-Z1707, 10582, from the Mzinene Formation, Albian IV or V of localities Z16 and Z17; SAM-PCZ19835 (Z1707), 10582, 19833(Z1162), 19834 (D1058/2) from the Mzinene Formation, Albian IV? or V from locality 54; OUM K10028, BMNH C78874 from the Mzinene Formation, Albian V from Bed 10 of the section at locality 51 of Kennedy & Klinger on the lower reaches of the Mzinene River in northern KwaZulu-Natal. OUM K10028 from the Mzinene Formation, Albian IV or V between locality 176 and the western end of locality 177 of Kennedy & Klinger (1975) in the Ndumu area of northern KwaZulu-Natal. Coiling is evolute, the ventrolateral tubercles of the inner whorls housed in the umbilical seam of the succeeding whorl. The umbilical wall is low and rounded, the whorl section compressed and lanceolate in intercostal section, with the greatest breadth below mid-flank, the intercostal whorl breadth to height ratio varying from 0.54 to ~0.62. The greatest breadth is at the umbilical bulla in costal section, with a costal whorl breadth to height ratio of 0.59-0.63. The venter is fastigiate, with a high, sharp, entire keel. There are 40-42 ribs on the outer whorl of the complete specimens. The ribs are strong, narrower than the interspaces, and have narrowly rounded crests. They arise at the umbilical seam, strengthen, and are crowded on the umbilical shoulder, where they vary in strength, the strongest developing a feeble to incipient umbilical bulla. The ribs are prorsiradiate and feebly flexed to near straight on the flanks. The stronger ribs develop prominent, sharp inner lateral tubercles that are as wide as the ribs; weaker tubercles also develop on some of the weaker ribs. 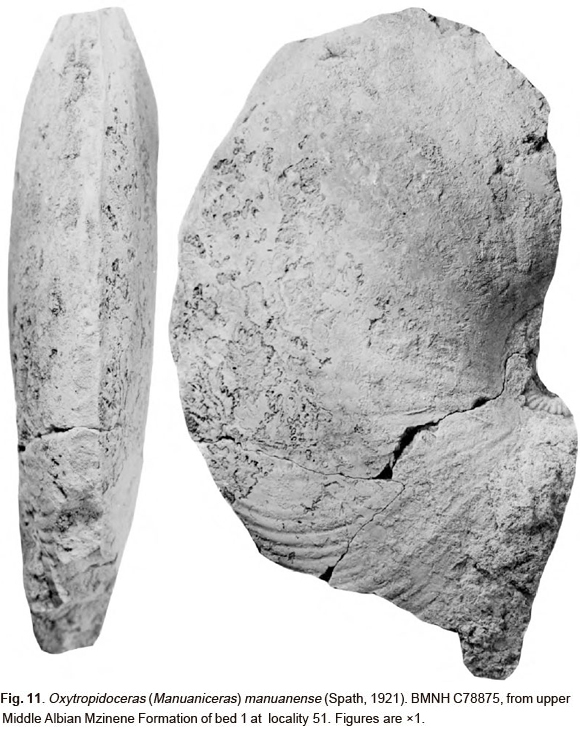 The holotype, PCZ19190 (D574) (Figs 13,14), has 25 tubercles corresponding to 43 ribs on the outer whorl. PCZ19835 (Z1707) (Fig. 16) has an estimated 18 umbilical tubercles corre- sponding to 49 ribs. PCZ19834 (D1058/2) (Fig. 17) has 17 umbilical bullae and 42 ribs on the outer whorl. There is no regular pattern to the sequence of tuberculate and non-tuberculate ribs, and the tubercles vary from weak to incipient in the weaker ribs. The ribs flex back from the lateral tubercles, strengthen, and connect to sharp, conical ventrolateral tubercles, at which point the ribs are at their strongest development. Beyond this tubercle, the ribs broaden markedly, and sweep forwards and terminate on the venter, which bears a high, sharp keel. The holotype has dense ribbing on the penultimate whorl. It is clearly pathological, with an asymmetric cross-section (Fig. 13), and weaker ribs, and no ventral tubercles on one flank. All but the last few centimetres of the outer whorl are phragmocone. PCZ19834 (D1058/2) (Fig. 17) appears tobeanincomplete adult, with a 180° sector of body chamber, the umbilical wall egresses markedly, the ribs crowding, weakening, and becoming more flexuous at the greatest preserved diameter. PCZ19835 (Z1707) (Fig. 16) has a 240° sector of body chamber preserved, but shows no indications of maturity, and is presumed to be a juvenile. BHNH C78874 (Fig. 18) is a very well-preserved fragment of body chamber with a maximum preserved whorl height of 90 mm, and 3-4 ribs that lack a flank tubercle between tuberculate ones. PCZ19833 (Z1162) (Fig. 19) is a huge body chamber fragment, with a whorl height of 144 mm, and a whorl breadth to height ratio of 0.65, indicating an original estimated diameter of ca. 330 mm. It bears seven ribs. Stronger ribs with prominent lateral tubercles are separated by two weaker ribs, which either lack, or have only a feeble lateral tubercle. There are sharp, narrow ventral tubercles that are no wider than the ribs. The ribs extend from these tubercles, are near-transverse to the point where they merge with the venter and pass into prorsiradiate riblets and striae that indicate the presence of a long, sharp ventral apertural rostrum. Although only a small number of specimens are available, the disparate size of the adult individuals indicate PCZ19834 (D1058/2) (Fig. 17) to be an adult microconch, PCZ19835 (Z1707) (Fig. 16) an incomplete macroconch, and PCZ19833) (Z1162) (Fig. 19) part of a macroconch body chamber. Oxytropidoceras (V) bituberculatum Collignon, 1977 (p. 19, pl. 8, fig. 1), from the lower Middle Albian of the Tarfaya Basin, Morocco, is a close ally of the present species. It differs in the coarser, concave ribs on the adapertural half of the outer whorl, compared to the denser feebly flexuous ribbing of the present material at the same size. Of the numerous species of Venezoliceras described from the lower Upper Albian of Venezuela by Renz (1968, 1982), O. (tf) multicostatum Renz, 1968 (p. 631, pl. 1, fig. 1, 2, text-fig. 5a; 1982, p. 56, pl. 16, fig. 4), O. (V) intermedium Renz, 1968, p. 634, pl. 2, figs 1-3; pl. 3, fig. 1, text-fig. 5b,c; Renz, 1982, p. 56, pl. 17, fig. 1), O. (V) karsteni Stieler, 1920 (Renz, 1968, p. 636, pl. 3, figs 2, 3; pl. 4, fig. 1, text-figs 5d-e, 6, 7a; 1982, p. 56, pl. 16, figs 2,3; pl. 17, figs 2, 3, text-fig. 4O), O. (V) commune commune Renz, 1968 (p. 639, pl. 4, fig. 2; pl. 5, figs 1-3; pl. 6, fig. 1, text-fig. 5f,g), and O. (V.) commune tenue Renz, 1968 (p. 642, pl. 9, fig. 1, text-fig. 5i) are all more finely and densely ribbed than the present material. O.(V). commune pulchrum Renz, 1968 (p. 641, pl. 6, figs 2, 3; pl. 7, figs 1, 2; pl. 8, fig. 3, text-figs 5h, 7b) has more finely ribbed inner whorls, but the outer whorl of the original of Renz' pl. 7, fig. 2 is close to the present material at the same size. The neotype ofO. (V.) venezolanum Stieler, 1920, is the original of Renz, 1968, p. 644, pl. 8, fig. 2, text-fig. 5m. According to Renz, it has 27 ribs at the umbilical shoulder and 35 at the ventrolateral shoulder at a diameter of60 mm. 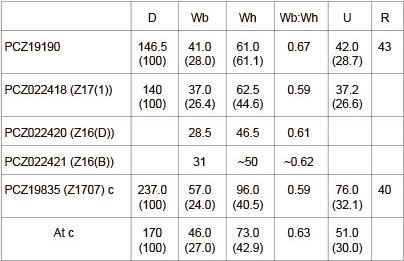 The total rib density matches that of some of the present specimens at the same diameter, from which it differs only in the more rapid coarsening of the ribs. The Venezuelan assemblage thus contains individuals close to those here referred to O. (V.) umsinenense but the majority of specimens are more finely and densely ribbed. Lower Upper Albian of northern KwaZulu-Natal. 1949 Venezoliceras madagascariense Collignon, p. 19, pl. 2, fig. 1. 1963 Venezoliceras madagascariense Coll. ; Collignon, p. 140, pl. 296, fig. 1284. 1968 Oxytropidoceras (Venezoliceras) madagascariense (Collignon); Renz, p. 646, pl. 9, figs 2, 3; pl. 10, figs 1, 3 4, text-fig. 5n. 1975 Oxytropidoceras (Venezoliceras) madagascariense (Collignon, 1951); Förster, p. 225, pl. 12, fig. 1, text-fig. 71. 1982 Oxytropidoceras (Venezoliceras) madagascariense (Collignon); Renz, p. 57, pl. 18, fig. 2. The holotype, by monotypy, is the original of Collignon, 1949, p. 19, pl. 2, fig. 1, illustrated here as Fig. 20, from the lower Upper Albian zone á Dipoloceras cristatum of Andranofotsy, Madagascar, in the collections of the École des Mines, Paris, now in the Université Claude Bernard, Lyon. SAM-PCZ022423 (Z16C), from the Mzinene Formation, Albian IV from locality Z16; OUM K10029, from the Mzinene Formation, Albian IV, between locality 176 and the western end of locality 177 of Kennedy & Klinger (1975) in the Ndumu area of northern KwaZulu-Natal. The holotype is a poorly preserved sandstone internal mould (Fig. 20), with an estimated original maximum diameter of 110 mm. Coiling appears to have been fairly evolute, the umbilicus broad and shallow, the umbilical wall low, the umbilical shoulder broadly rounded. The whorl section is compressed lanceolate in costal section, with the greatest breadth well below mid-flank. The greatest breadth is at the lateral tubercle in costal section. There are an estimated 14 ribs per halfwhorl. The ribs arise at the umbilical seam, and all are predominantly primaries on the adapertural half whorl at least, strong, straight and narrow on the umbilical wall, and strengthen across the umbilical shoulder. Theyare straight and prorsiradiate on the flanks, occasionally bifurcating, with occasional intercalatories. On the adapical half whorl, every third rib develops a small, sharp mid-lateral bulla. On the adapertural halfwhorl one or two non-bullate ribs separates the bullate ones. All ribs bear small sharp ventral tubercles that give rise to broad transverse ribs that efface before reaching the high ventral keel. It is not possible to establish the position of the final septum. SAM-PCZ022423 (Z16C) (Fig. 5B) is an internal mould with an estimated 120° sector of body chamber. The total diameter is estimated at 100 mm. Coiling is moderately evolute, with a shallow umbilicus. The umbilical wall is low and rounded, the whorl section compressed, with the greatest breadth at the lateral tubercle in costal section, and below mid-flank in intercostal section. The umbilical shoulder is broadly rounded, the whorl section stoutly lanceolate in intercostal section. Ornament is of two types. On the penultimate whorl, visible in the umbilicus of the outer whorl, it consists of fine, sharp, prorsiradiate, feebly flexuous ribs, most of which arise at feeble umbilical bullae, with intercalated ribs arising on the inner flank. On the outer whorl, the ornament is coarse. There are 18 ribs, alternating more or less regularly long and short, on the adapertural halfwhorl. They are narrow, straight and prorsiradiate, and vary markedly in strength and tuberculation. Strong primaries arise at the umbilical seam, and are strongly flared, with an umbilical bulla linked to a stronger lateral tubercle that is the same width as the rib. The ribs decline in elevation on the outer flank, and link to strong ventrolateral bullae. Up to three weaker ribs intercalate between successive bullate primaries, most of which extend to the umbilical shoulder. They may develop a feeble outer lateral tubercle, and strengthen to match the primary ribs on the ventrolateral shoulder, where all ribs form a sharp, narrow tubercle. The ribs flex forwards over the ventrolateral shoulder, taper, decline in strength, and efface before reaching the strong, high, ventral keel. OUM K10029 (Fig. 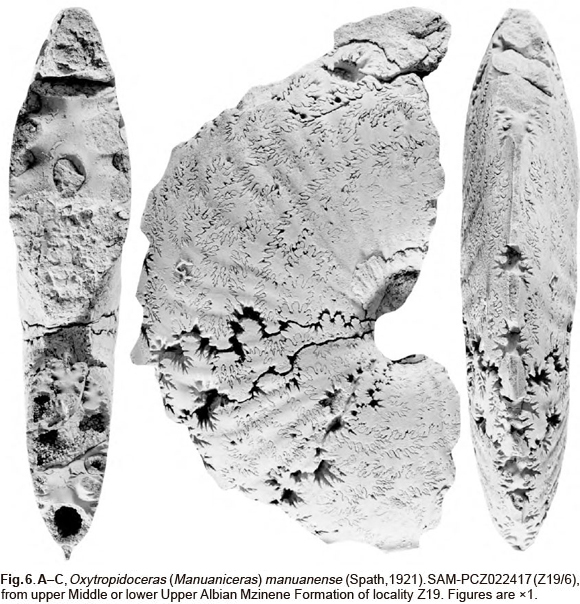 21) is a phragmocone retaining traces of recrystallized shell with a maximum preserved diameter of 127 mm, and much of the ventral region lost. The ornament of the penultimate whorl is as in the previous specimen. There are 22 primary ribs on the outer whorl. They arise at the umbilical seam, and are narrow straight and prorsiradiate on the umbilical wall, strengthen markedlyon the umbilical shoulder, are straight and prorsiradiate on the flanks, across which they strengthen progressively. Massive pointed lateral bullae that are the same width as the ribs strengthen progressively around the outer whorl, the bullate ribs separated by from one to four non-bullate ribs, All ribs bear bear strong ventrolateral bullae. SAM-PCZ022423 (Z16C) compares well with the worn holotype (Fig. 20), and the material from Venezuela referred to this species by Renz (1968, p. 646, pl. 9, figs 2, 3; pl. 10, figs 1, 3, 4, text-fig. 5n; 1982, p. 57, pl. 18, fig. 2). OUM KY10029 has rapidly coarsening ribs and massive lateral bullae, and approaches O. (Venezoliceras) robustum Renz, 1968 (p. 647, pl. 10, fig. 2; Renz, 1982, p. 58, pl. 18, fig. 4; pl. 19, fig. 1), which may be a junior synonym of madagascariense. Upper Middle and lower Upper Albian ofKwaZulu-Natal, southern Mozambique, Madagascar and Venezuela. 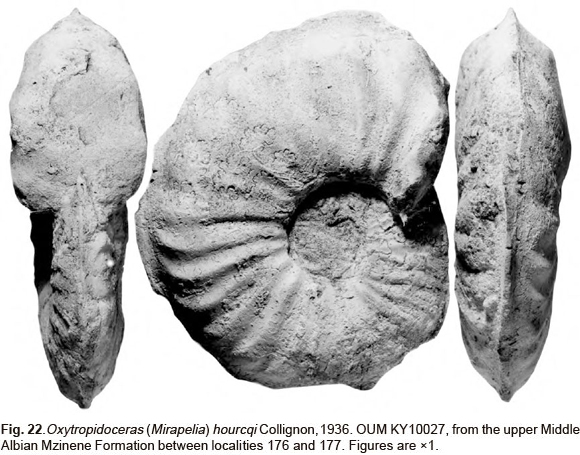 Ammonites mirapelianus d'Orbigny, 1850, p. 124, by the original designation of Cooper, 1982, p. 291. 1936 Oxytropidoceras hourcqi Collignon, p. 184, pl. 20, fig. 5, text-fig. 12l. The holotype is the original of Collignon, 1936, p. 184, pl. 20, fig. 5, text-fig. 12l, a specimen in the Sorbonne collections, now housed in the Laboratoire de Paleontologie of the Muséum National d'Histoire Naturelle, Paris, from the upper Middle Albian of Androiavy, Madagascar. OUM KY10027, from the upper Middle Albian, Albian IV, Mzinene Formation between localities 176 and 177 of Kennedy & Klinger (1975), southwest of Ndumu in northern KwaZulu-Natal. OUM KY10027 is a worn internal mould, septate to a diameter of 126 mm. Coiling is moderately involute, with 64% of the previous whorl covered. The shallow umbilicus comprises 25.4% of the diameter, the umbilical wall low and subvertical, the umbilical shoulder quite narrowly rounded. The whorl section is compressed, with a whorl breadth to height ratio of 0.66, the greatest breadth well below mid-flank. The inner flanks are broadly convex, the outer flanks convergent, the section concave from the ventro-lateral shoulders to the strong, high, siphonal keel. An estimated 18 ribs arise at the umbilical seam, and strengthen across the umbilical wall and shoulder. They give rise to one, occasionally two ribs, while there are also a few long intercalated ribs, to give a total of approximately 30 ribs at the ventrolateral shoulder. The ribs are broad and coarse, straight to feebly convex, and recti- to feebly rursirdiate on the inner flanks. They flex forwards and are feebly concave on the outer flanks, where they strengthen and broaden before sweeping forwards and declining on the ventrolateral shoulders and venter, where they form an obtuse chevron with the siphonal keel at the apex. The holotype of O. (M.) hourcqi is a much larger individual than the present specimen, being some 225 mm in diameter, but with essentially the same style of ornament. The differences between the holotype and other contemporaneous Madagascan species based on similarly large individuals including O. (M.) paucituberculatus Collignon, 1936 (p. 187, pl. 18, fig. 4), O. (M.) boulei Collignon, 1936 (p. 183, pl. 18, fig. 6, text-fig. 12j), and O. (M.) colcanapi Collignon, 1936 (p. 182, pl. 18, fig. 7, text-fig. 12k) are likely to be those of individuals rather than species. O. (M.) mirapelianum (d'Orbigny, 1850) (p. 124) has much stronger, narrower ribs on the inner flank, and a much more marked thickening on the ribs on the outermost flanks and ventrolateral shoulder, while the ribs are near-transverse on the venter (Kennedy, Bilotte & Hansotte, 1997, p. 466, pl. 5, figs 12, 13), rather than forming an obtuse chevron as in the present specimen. 1936 Oxytropidoceras colcanapi Collignon, p. 182, pl. 18, fig. 7, text-fig. 12k. The holotype is the original of Collignon, 1936, p. 182, pl. 18, fig. 7, text-fig. 12k (reillustrated here as Fig. 23), a specimen in the Sorbonne collections, now housed in the Laboratoire de Paléontologie of the Muséum National d'Histoire Naturelle, Paris, from the upper Middle Albian of Berambo, Madagascar. OUM KY10030, from the upper Middle Albian, Albian IV, Mzinene Formation between localities 176 and 177 of Kennedy & Klinger (1975), southwest of Ndumu in northern KwaZulu-Natal. OUM KY10030 is an approximately 180°whorl sectorwith a maximum preserved whorl height of 50 mm. Coiling is evolute, the umbilicus comprising 25% of the diameter approximately. The umbilical wall is low and convex, the umbilical shoulder broadly rounded. The whorl section is compressed lanceolate, the greatest breadth around mid-flank, the inner to mid-flank region broadly convex, the outer flanks convergent, the venter with a strong, high siphonal keel. Fourteen primary ribs are present on the fragment. They arise at the umbilical seam, and pass forwards across the umbilical wall and shoulder. They are strong, straight, crowded, and feebly prorsiradiate on the inner flanks, across which they strengthen progressively, flexing forwards, broadening and strengthening markedly on the outer flank and ventrolateral shoulder, sweeping forwards and declining on the venter, where they form an obtuse chevron with the siphonal keel at the apex. The flank ornament of this specimen is closely comparable to that of the holotype (Fig. 23) a much larger individual, 210 mm in diameter according to Collignon, and with the same rib density. The present specimen differs from the slightly larger individual referred to O. (M.) colcanapi, described above, in having exclusively primary ribs that arise singly from the umbilical seam without any bifurcations on umbilical shoulder. It differs from O. (M.) mirapelianum in the orientation of the ribs on the venter, which form an obtuse chevron, rather than being near-transverse. Cooper (1982, p. 296, 304) regarded colcanapi as a possible synonym of O. (M.) buarquianum (White, 1887), but noted that 'the true affinities of the Madagascan material must await reassessment at population level', a view with which we can only agree. Upper Middle Albian of northern KwaZulu-Natal and Madagascar. We thank the staff of the Department of Earth Sciences, Oxford, and the Oxford University Museum of Natural History and Natural History Collections Department, Iziko South African Museum for technical support. Kennedy acknowledges the financial support of the Oppenheimer Fund (Oxford) and Klinger the NRF (South Africa). We thank Dr Herbert Summesberger (Vienna) for constructive comments.